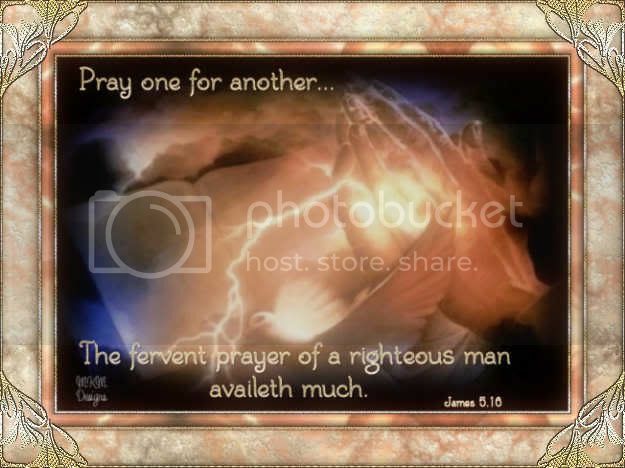 Groups > Persecuted Christians > Discussions > Topic: LET US PRAY IN UNITY! Topic: LET US PRAY IN UNITY! Let us pray in unity! We have come together to meet in this group so that we can understand what is happening and we have come to help the church builders and persecuted Christians. I hope that we have come in the unity of Christ. We have wonderful hosts, Bradley; although he doesn't post much, is a wonderful prayer warrior and if you ask for prayer from Bradley he will not let you down. Michael has been faithful from the very beginning to post and to be a part of the group. I am so grateful to the Lord that he is a host. Kim is new and she is still learning. She has been posting about what aetheists do to Christians, Please be patient, I know that her heart is in the right place. If any one wants to join us to host this group, please let me know. We ask that you keep us united in you, give us wisdom and lead us along the right path. Help us to remember that we are all one body in you. If you want to be a host please contact me! LET ME HOPE YOU ARE OKAY. I AM SORRY TO HAVE TAKE LONG WITHOUT COMMUNICATING TO YOU BECAUSE I HAVE BEEN HAVING SOME TOUGH TIME BECAUSE WHERE I DO STAY WAS SOLD OFF TO AN INVESTOR AND I WAS LOOKING FOR SOME MONEY SO THAT I CAN LEAVE THE PLACE TO GO AND RENT IN ANOTHER PLACE.WHICH IS NOT Really EASY SO I NEED YOUR PRAYERS. I WANT TO PART OF WHAT YOU DO LIKE CHECKING ON US AS SINGLES AND FOR YOUR ENCOURAGEMENT,I WISH YOU A GREAT MOMENT. Julius, my prayers that God will help you with the tough times and problems in Jesus name amen. On May 9, Hawa Abdalla Muhammad Saleh was arrested in an Internally Displaced Persons camp in Darfur. Authorities have accused her of possessing and distributing Bibles and promoting Christianity. Sources said she could be tried for apostasy, which carries the death sentence in Sudan. At the same time, in Khartoum a Christian mother of a 2-month-old baby is wounded and destitute because she and her husband left Islam for Christianity. In several countries in Northern Africa, officials often refuse to register Christian names to children born to Christian parents. Such was the case for parents Ahmed and Maxine who resorted to hiring an attorney to help legally give baby Eva her name. ICC has recently learned that Congress is planning to end a 20 year humanitarian program that has allowed persecuted Christians and other religious minorities in Iran access to an American Embassy so that they can apply for refugee status and protection. Without the program, persecuted Iranian Christians who are unable to flee the country will likely face imprisonment or execution. If the program is not renewed, 688 persecuted Iranian minorities who have already begun the refugee application process will be trapped in Iran and may be arrested along with the 254 Christians who have been arrested since June 2010. One of the imprisoned, Pastor Yousef Nadarkhani, was issued the death sentence for apostasy in September. Rep. Lamar Smith, chair of the House Judiciary Committee, is calling for oversight of this amendment and all immigration policy, which could lead to the end of the program in Iran. Call Congressman Smith and the other members of the House Judiciary Committee (find their numbers at right) and ask them to permanently instate the Lautenberg Amendment. I understand that Chairman Smith and the judiciary committee is withholding the Lautenberg Amendment from the budget until it can be further investigated. I am calling to voice my concern over this move and ask that the committee support this important program in the budget as soon as possible to ensure that it is not ended, and that if it is stopped during the investigation, the committee will instate provisions for the immediate safety of Iranian religious minorities. I am concerned over the severe persecution that Baha'i, Christians and Jews face in Iran, and believe that if we cut this program it will send the wrong message to Iran about our support for the religious communities increasingly being targeted by the government. I hope you will allow this program to go forward on the budget so that it does not have to be moved in a stand-alone bill which would draw more dangerous attention to the religious communities already suffering in Iran. After you've made the call yourself, spread the word and ask your friends to call. You can send them to this page where they can learn about the amendment and what they can do to help. Also feel free to reference our press release on the amendment. This summer Open Doors is preparing churches for one of the greatest efforts in our country to unite the body of Christ. 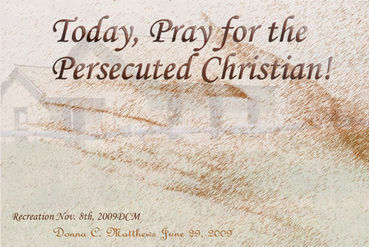 On Sunday, November 13, International Day of Prayer for the Persecuted Church, believers will unite in prayer for Christians who share our faith but not our freedom. Churches, small groups and families will be given access to a free ONE WITH THEM online experience. It will include videos, touching and sometimes shocking testimonies, extraordinary facts about believers around the world, and guidelines for dynamic group interaction. This ONE WITH THEM online experience will intensify your walk with God, draw you closer to your friends and family, and connect you with the struggling but courageous worldwide body of Christ. 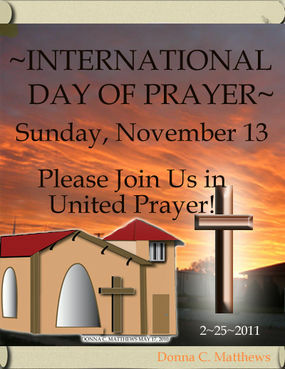 Tell your pastors, friends and family to update their calendars for Sunday, November 13. Troubling news invades our day. Politicians destroy public trust, wars and conflict rage onward, reports of economic and environmental disasters flood the media. It is easy to lose hope. But in the midst of these events God is working. Unseen by the media's eye He is moving in lives, shaping communities and bringing many into His kingdom. This week let us praise His Holy Name in countries like North Korea, Algeria and Syria and Colombia. Amir was cleaning his friend's apartment when he stumbled across a New Testament. Suffering from depression, he began reading Gods Word. They were just simple school kits, but for Juan it meant that he could attend class. It was just a ladies seminar, but for Ludis who had traveled over 26 hours to attend, it was life changing after the death of her husband. Through your support, Open Doors helps Colombian persecuted Christians to stand strong and overcome adversities in their lives. then join in prayer for our brothers and sisters in North Korea. Serge and Naama Kogen, both Messianic Jews, befriended their neighbor's 16-year-old troubled daughter. In response, Yad L' Achim, a Jewish ultra-Orthodox group in Israel, led a protest in a Jerusalem suburb falsely accusing the couple of proselytizing a minor. Myat (not her real name), born into a Christian family, faced a life of poverty discrimination, and oppression. As an adult she developed a heart to share the gospel with Burmese Buddhists in her country. But, when cyclone Nargis struck, she ended up adopting nine orphaned children. Myat shares her powerful testimony of how she prayed for seven years that God would provide the resources she needed to not only take care of her family, but also fulfill her calling to share the Gospel. VOM's contacts are reporting a new development in the case of Youcef Nadarkhani. His lawyer has finally received the written ruling from the Supreme Court. According to one source, the Supreme Court has agreed with the death sentence verdict. However, the court "pointed out procedural flaws and is asking the lower court to re-examine the case." The judges would like clarification as to whether Youcef was truly a Muslim prior to becoming a Christian. If Youcef is determined to have been a "true" Muslim, and he does not recant his Christian faith, the death sentence will stand. There is no guarantee Youcef will not be executed before the court re-examines the case. Pastor Lamelas, who once served as national president of his denomination in Cuba, was granted asylum in the United States due to the persecution he has endured for more than five years at the hands of Cuban authorities. At the early age of 11, Sam was living a pious Muslim life in a small Philippine village. Ninth among 12 siblings, Sam was the only one sent to school. He excelled both in the classroom and sports; was popular and well-loved. But everything changed one afternoon when he picked up a Bible. Starting August 1, Muslims will begin celebrating the holy month of Ramadan by seeking God through fasting and prayer. Being more sensitive to hearing from God at this time, opportunities are increased to draw them toward the truth of the Gospel. Sign-up to receive a 30-day prayer calendar and other materials to use during Ramadan praying for God, through the prayers of Christians, to reach the Muslim World.